India suffers from a massive electricity deficit with large areas of the country undergoing power blackouts of as long as 8-10 hours on a regular basis. During summer months the problem becomes even more acute when house appliances like fans, air coolers, air conditioners are being used in an increasing number of homes and offices. After air conditioners and refrigerators, energy-efficient fans are making their way into homes ahead of autumn/winter this year. Japanese major ROHM Semiconductor India Pvt. Ltd. (RSI) has announced the introduction of its path breaking Solutions for driving BLDC motors in India. These solutions, compared to the less expensive AC Induction motor, are easy to control and around 50% more efficient, thereby reducing power consumption in home appliances and Industrial equipment. The solutions are designed with features to reduce the design time and hence enable a faster time to market. These drivers along with the easily customizable reference designs will propel local design, which is the key to manufacturing locally. The Government of India through its various initiatives, is starting to focus on energy conservation by propagating use of energy efficient BLDC ceiling fans, CFL and LED bulbs as opposed to conventional fans using AC induction motor and filament bulbs. Speaking to the media, Daisuke Nakamura, Managing Director, ROHM Semiconductor India said, “With the government’s initiative towards BLDC ceiling fans, we see that all the ceiling fan manufacturers are trying to create a solution that is both efficient and cost effective. This technology transition has presented an opportunity for new entrants too." Nakamura adds saying that most of the ceiling fan companies have design capability for the electrical motors, but not so much research for the electronics design, which eventually contributes to efficiency and energy conservation. This is where ROHM India has come in, by providing a wide range of reference solutions that will match most of the customers and market requirements. Consumer durables companies like Orient, Superfan, Panasonic have all launching fans with BLDC technology (Brushless Direct Current motors) that use just about 50% of the energy used by regular fans. Traditionally, fans consume about 70 watt of electricity an hour, and companies say that fans with BLDC technology would consume only 32 watt an hour. 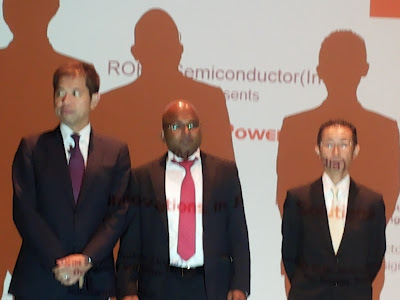 So fans with BLDC motors typically cost about Rs 300 to Rs 500 more than regular fans, but considering that they consume about 50% less power, the user would get back his investment in about a year,” says Brito Victor, Head India Design Centre of ROHM Semiconductor India. In 2015, India manufactured around 40 Million ceiling fans, with around 10% growth year-on-year. If every single ceiling fan manufactured from here on is made into an energy efficient BLDC ceiling fan, rough calculation indicates that, by 2025, the country can reduce peak-power capacity addition by around 10 GW, which is equivalent to saving around 5 midsized power plants. The ESDM (Electronics and Semiconductor Device Manufacturing) Industry in India is in crisis as it is bombarded by imports. “Make in India” is a key Initiative that can give some respite to the ever growing trade deficit. The deficit will reach US$200 billion by 2025. 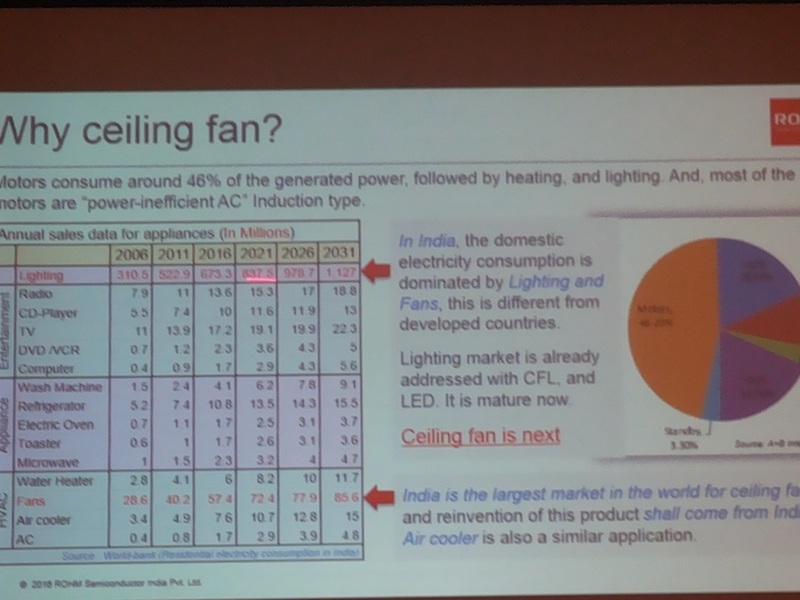 India being the world’s largest manufacturing base for the ceiling fan can use this technology transition as an opportunity to stimulate the electronics manufacturing industry. In the BLDC ceiling fan, the electronic components will cost about one–third of the total fan cost. Also, the Indian ceiling fan manufacturers can assemble the electronics board by themselves or engage EMS companies. Either way, the BLDC motor solution will have a positive impact on the ESDM industry in India.